In November of 1922, a young foreign correspondent writing for the Toronto Star, kissed his wife goodbye at their home in Paris and boarded a train for Switzerland to cover the Lausanne Peace Conference. Like many young writers just starting out, Ernest Hemingway had not yet found his way into publishing the kinds of works he really wanted to produce, but he managed to get some networking done while working his day job and soon editor Lincoln Steffens expressed an interest in his fiction. At that point, Hemingway did what any writer looking for his big break would surely do. He contacted his wife Hadley in Paris and asked her to bring his writing to Switzerland. Hadley readily agreed and packed up her husband’s work, carbon copies and all, into a small suitcase. Then she boarded a train just as soon as she could. Before the train pulled out of the station, Mrs. Hemingway stowed her bags and left them just long enough to locate and buy a bottle of water. When she returned, the suitcase containing all the written works of her future Pulitzer Prize winning ex-husband was gone. The works lost included several short stories as well as a novel about World War I.
I don’t know about you, but to me this is a soul-crushing kind of a story. I’ve borne witness to the agony authors feel when their laptops self-destruct and swallow partial manuscripts. I myself have misplaced thumb drives or failed to back up scenes and lived to regret it. Thousands of words have tripped from my fingertips and fallen, for one reason or another, off the face of the earth, never to be recovered. No matter how careful we are it happens. And it’s not always the worst thing ever. Often it leads to better scenes, more careful word choices, more thoughtful expressions, and all around improved creative works. Sometimes, it even pushes us to find new ways to share our work with the world. Recently I lost a novel. I didn’t leave it unattended in a suitcase at the train station, though some days it feels like that’s what happened. Instead I entrusted it to a publisher that fell on hard times and proved unable to care for the work as promised. The somewhat complicated situation has caused me many sleepless nights and no shortage of agony, but I also count myself lucky. As the author of a project that had not yet reached publication (something that after a previous one-year delay was finally supposed to happen this past month), my position is not as difficult as many of the authors this publisher used to work with before ceasing all communications and leaving everyone scrambling for a way to reclaim their rights. I know that some of you lovely readers will want to venture legal advice and while I appreciate the desire to help, I assure you I’ve explored a lot of options and carefully considered my best course of action. I’ve had a long time to watch this play out. I just wanted to include you in the loop, and also assure you that the book is going to make it into the world eventually, just not in the way I had originally hoped. What’s the best way to cope with losing a book? Write another one, of course! So you see it could be a lot worse. Hemingway never attempted to re-write the novel he lost. Instead he went on to write bigger and presumably better things, but it seems he may have never totally recovered from the loss either. In some of his drunker moments, he was known to occasionally admit that the loss of all of his work at once was a big factor in his decision to divorce his first wife. All I need to do is divorce a publisher. July 26, 1875 wasn’t a great day for John Shine. The man who would later become a US Marshal and a California state senator, at the time, worked as a stagecoach driver for Wells Fargo. That day, only a few miles outside of Calaveras County, he encountered a man standing in his path. He wore a flour sack over his head and he held a shotgun leveled at Shine’s chest. In a commanding voice, the flour sack asked politely for Shine to throw down the locked strong box, and happily reminded his accomplices hiding behind the boulders with nothing but their deadly shotgun barrels showing, to shoot the driver should he refuse to comply. Shine didn’t need to be asked twice. He threw down the box. The gentlemanly outlaw allowed the stagecoach to move on down the trail. Only later, when Shine returned to the scene, did he realize that the flour sack’s accomplices were nothing more than well positioned sticks. This was most likely the first stagecoach robbery committed by the outlaw who would come to be known as Black Bart. Named (by himself) after a dime novel villain, Black Bart would go on to pull close to twenty-five robberies of Wells Fargo stagecoaches, netting himself a total of around $18,000. The sum was a small drop in the big bucket of about $415,000 Wells Fargo lost to stagecoach robberies over a fifteen year period. But Black Bart set himself apart. He always worked by himself, never rode a horse, and refused to behave in an ungentlemanly manner. Not once did he fire a shot or steal so much as a dime from a passenger. It’s munny in my purse. The robber signed both poems as “Black Bart, the P o 8.” Get it? Because he’s a po-eight! I assume that’s the idea anyway. He was also pretty great with a license plate. And that, it turns out is a good thing because in November of 1883, Black Bart’s reign of crime came to an end. During what became his final robbery, Black Bart took fire and a bullet grazed his hand. He managed to escape, stemming the bleeding with a handkerchief that bore a laundry mark. Then, somewhere along the way, he dropped the handkerchief. Because Wells Fargo detectives are evidently well versed in every crime drama ever, they conducted an extensive search and traced the handkerchief to a laundry in San Francisco where they learned that it belonged to Charles Bowles, a mild-mannered, gray-haired gentleman who lived a quiet, but elegant life in a boarding house nearby. Mr. Bowles was sentenced to six years in prison for his string of robberies. The moral of the story, obviously, is that the only way to make money writing poetry is to also rob a stagecoach, and even then, only if you don’t get caught. And that, my friends, is why you should stick to writing novels. It just so happens it’s National Novel Writing Month. So you better get started. These days, a good stagecoach robbery is a hard thing to pull off. What Scottish-born writer Robert Louis Stevenson had been conjuring in his dream was the transformation of the upstanding Dr. Jekyll into the monstrous Mr. Hyde. When he put pen to paper to tell the story, his wife claimed it took him just six days to complete it. 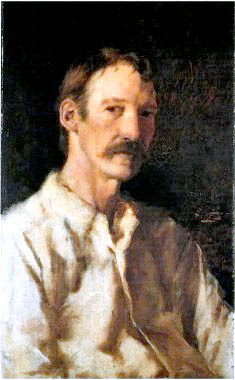 Robert Louis Stevenson looking a little haggard. Like maybe he has TB. Or a cocaine problem. Or nightmares. Or maybe he just wrote a beloved classic novella in SIX DAYS. Probably suffering from undiagnosed tuberculosis for most of his life, Stevenson was quite ill when The Strange Case of Dr. Jekyll and Mr. Hyde came tumbling out of him. Some have suggested the feverish pace with which he wrote the novella came from a cocaine binge, but his family insisted that it was simply the frustrated workings of bedridden genius. Whatever spurred him, Stevenson seems to have mirrored his characters, stepping outside of himself for those six days to indulge the part of him that had a story to tell, maybe a brilliant allegory of addiction, and certainly a classic story of the capacity for both good and evil inside each of us. I’m sure you’re at least somewhat familiar with the story, but even so, it’s a quick read and well worth it if you’ve never opened it up. Maybe knowing that the initial draft was written in only six Hyde-like days makes it all the more chilling. And maybe inspiring. Because it’s November, which means that it’s that time of year when writers of all walks of life, some experienced and some not, step outside of themselves and write a novel. 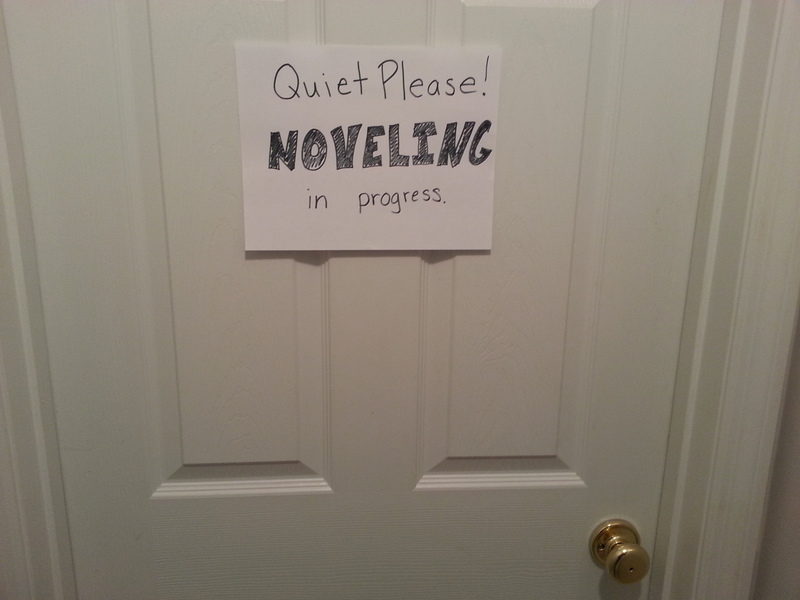 I swear I’ll get started on those 50,000 words as soon as I make this really important sign for my office door. National Novel Writing Month (NaNoWriMo) began in 1999 with the decision of 21 friends in the San Francisco Bay Area to set themselves a ridiculous goal to each write a novel within a month. It sounds crazy at first, because, well, we’re talking about a novel here. It’s a long project full of research and imagination. Some of the greatest novels ever written took years or even decades to complete. And some of the worst novels did, too. Snoopy wrote for fifty years and never made it past his opening line. But it turned out there was purpose in the madness of the plan, even if the original participants didn’t realize it at first. The group had such a good time with the challenge, they opened it up to a wider community the next year and 140 people participated. The year after that it was around 5,000. In November of last year, 310,000 adult writers and 89,000 young writers, from all over the world, participated in NaNoWriMo. Not all of them completed the 50,000-word goal, but 400,000 people stepped outside of themselves to indulge that part of them that had a story to tell. What started as a silly little writing challenge has blossomed now into a huge network of encouragement, with resources for writers at every stage of the game before, during, and long after that initial, probably terrible, first 50,000-word draft. The Strange Case of Dr. Jekyll and Mr. Hyde is around 26,000 words, initially written in just six days, which gives me 24 days to write my additional 24,000 words. No problem. I heard about NaNoWriMo for the first time a few years ago through my local library that was sponsoring a series of “write-in” events in conjunction with it. I’ve since had lots of friends participate in the event. So, this year, I’m finally doing it. I’ve researched, planned, and outlined what I hope will be become 50,000 revision-worthy words. In December, I’ll have to drink my potion and let Dr. Jekyll take back over to do the real work of revision, revision, and still more revision. But for now, I am stepping outside of myself and indulging my Mr. Hyde (minus the cocaine) because he’s got a story to tell. Good luck to all my fellow NaNoWriMos out there! 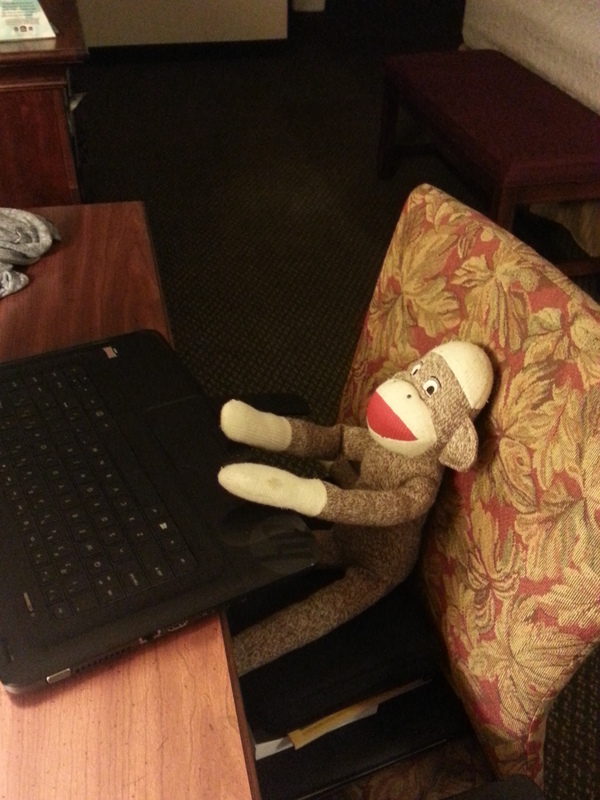 Obviously I’m glad you stopped by, but seriously, stop reading blog posts and get to work. You have a novel to write!